Former UK Prime Minister Tony Blair should be impeached for a deliberate attack against Iraq which is part of a British plan to have war on Islam keeps ongoing, says Rodney Shakespeare, an academic and political analyst based in London. Shakespeare, a professor of Binary Economics in London, made the remarks in an interview with Press TV on Monday, after Scottish National Party (SNP)’s Alex Salmond said Blair should be taken to the International Criminal Court (ICC) for involving the country in the 2003 invasion of Iraq. The SNP foreign affairs spokesman has begun rallying support for the impeachment of Blair, pending the publication of the Chilcot inquiry report into the UK’s involvement in the 2003 Iraq invasion on July 6. “Tony Blair should be impeached. It is bigger than his collusion with George W. Bush. The sequency of events goes back to 9/11 in which the UK has colluded in suppressing the truth, which was a false flag attack organized by elements of Saudi Arabia, the CIA and Israel in order to set in motion a wholesale onslaught on Islam,” said Shakespeare. “The second wave of that was the attack on Iraq in which Blair and Bush colluded at a ranch in Texas,” he added. “It is not widely known that one of the underlying reasons was to rip off the assets of Iraq. The Bremer orders — Paul Bremer was the second governor general in Iraq — there are 100 of them — the Bremer orders in fact reveal the intent to rip off every aspect of the Iraqi economy,” the analyst pointed out. In March 2003, the US and Britain invaded Iraq in blatant violation of international law and under the pretext of finding WMDs; but no such weapons were ever discovered in Iraq. More than one million Iraqis were killed as the result of the US-led invasion, and subsequent occupation of the country, according to the California-based investigative organization Project Censored. “And it has continued because America and the UK are supporting Daesh. They are supporting via supporting Saudi Arabia, where Wahhabism is the great powerful force, financing for the philosophy and the organization, via Turkey and Qatar. And Daesh is now, of course, making big to smash up the Middle East,” he stated. “So Tony Blair should be impeached for a deliberate attack as part of Bush’s plan originally to have war on Islam keeps ongoing. The public has never been told that it’s about ripping off the assets as well,” the commentator said. “And America and the UK have continued the war in helping and supporting Daesh, particularly in their support of the regime in Saudi Arabia, Bahrain, and Turkey,” he observed. According to a White House memo, titled “Secret… Memorandum for the President”, Blair had agreed to support the war a year before the invasion even started, while publicly the British prime minister was working to find a diplomatic solution to the crisis. The document, which was sent by then-US Secretary of State Colin Powell to President Bush on March 28, 2002, also disclosed that Blair agreed to act as a spin doctor for Bush and convince a skeptical public that Iraqi dictator Saddam Hussein had Weapons of Mass Destruction, which actually did not exist. 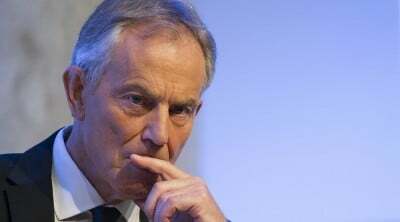 Blair has always denied the claim that he and Bush signed a deal “in blood” at Crawford, Texas, to launch a war against Iraq that began on March 20, 2003, that has killed hundreds of thousands of people. The Powell memo, however, showed how Blair and Bush secretly prepared the Iraq war plot behind closed doors at Crawford.